Set in Belfast and Derry during a period often known as ‘The Troubles’, I focussed this novel on a group of young nurses who are trying to live ordinary lives in extraordinary times. They find their experiences inevitably, relentlessly, involved in the civil unrest. Because I was a student nurse, general nurse and then midwife in a large teaching hospital in Belfast, between 1968 and 1973 and subsequently worked as a health visitor, in Derry City between 1978-81 I am able to base the background on some my experiences although of course the stories and characters are fiction. 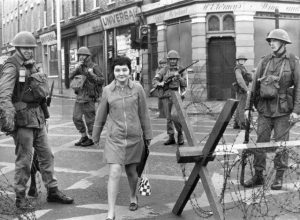 The main character Teresa McCann and her friends Eileen, Caroline and Sue are changed by the circumstances surrounding them, coming face to face with terrorists, soldiers and riots in their everyday working lives. Other characters play their part in influencing the lives of the friends with both humour and aggression, love and betrayal. 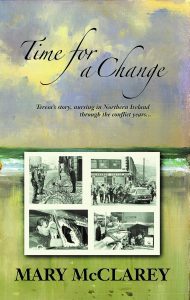 The story offers an insight into the changes which were taking place in Northern Ireland which were so very different from the ‘swinging sixties’ enjoyed elsewhere. The gripping headline of the Belfast Telegraph, quoted in the opening sentence ‘Troops into Belfast, thousands disembark, armed with bayonets’ gives an indication of the flavour of this novel, but of course it is so much more than a depiction of the civil unrest. It is the seldom-told story of young people who are neither heroic nor political. But they are caring, compassionate and, when required to be, very brave. It was an extraordinary period of British/Irish history and is being told from the perspective of young people, with humour and compassion. Riots : Belfast. October 1969. 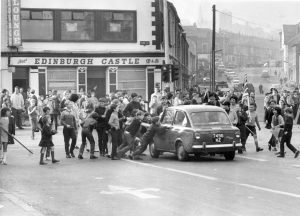 Traffic at the junction of York Street and Whitla Street was blocked by flag and placard bearing children, who forced vehicles to turn around. The crowds later allowed traffic to move normally. Similarities to ‘Long Road, Many Turnings’ are the twists and turns contained within this novel, as readers might expect. One bonus to readers of the first book will be to learn what happened next – continuing the stories of Agnes, Teresa and Bailey’s son, Junior. A range of social issues are touched upon – domestic violence, religious intolerance and the crippling effects of physical violence on communities and individuals. National incidents have been portrayed as accurately as possible, but this is not a historical document, I leave that to others. A nice surprise! A friendly, relaxed interview by journalist Martin Freeman resulted in Western Morning News pblishing this…. To purchase this book, signed by me at a special ‘author’s friends’ rate of £7.00. 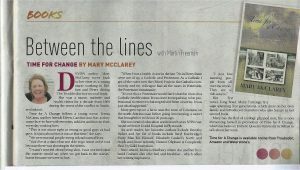 (RRP: £8.99) email marymcclarey@gmail.com for your signed copy.